After a few hundred bottles, my Wilko capper has rapidly deteriorated the last batch I bottled. Are there better options or should I treat it as semi disposable? I've been thinking about a bench capper but seen mixed reviews. Either way something robust seems a good call, it would probably save a bit of time too. I've had my bench capper for about 4 years and its still going strong. And it was a present from a friend. He had just got a couple of cornies, so it was well used before I got it! Having heard friends stories about capping issues, I wouldn't even consider getting something less robust! The big Ferrari floor stander bottle capper that Rob sells is unbeatable . . . And most certainly unbreakable! it's big n bulky but no fail and does both sizes of bottle cap. I have one (Christmas a couple of years ago) and I like it but almost any bench caper is better than a hand caper. +1 for this capper, it's a brute! Not only does it do both sizes of cap, it also accommodates every bottle size i've thrown at it and adjusts magically! Been great so far, no complaints at all. Ferrari Emily is the one I have. It's plastic but pretty heavy duty. Cheaper than a bench capper and I've been happy with it up til now for sure. xCamel xSlayer wrote: Ferrari Emily is the one I have. It's plastic but pretty heavy duty. Cheaper than a bench capper and I've been happy with it up til now for sure. Does anyone know of a smaller one? I've been debating making a small wall/bench mounted one. krazypara3165 wrote: Does anyone know of a smaller one? I've been debating making a small wall/bench mounted one. Not hard to put together, not adjustable, "don't over think it", use one or two blocks of wood under stumpy bottles. Bell end was turned on the lathe, trial and error on a new cap, couldn't find the specification measurements for them at the time, but they are not expensive to buy, or you may be lucky and get one from a "belly up" nipper type capper, there are plenty of those about. Springer wrote: Bell end was turned on the lathe, trial and error on a new cap, couldn't find the specification measurements for them at the time, but they are not expensive to buy, or you may be lucky and get one from a "belly up" nipper type capper, there are plenty of those about. Was a little harder than I thought to get the shape right for some reason, maybe on a bad day, I would buy one. I have this one for a couple of years. It is great bottler, well made, but not cheap. Have not had any problems with it at all. Not that I am aware of. I did not pay as much as that at the time mind. I think the current pound/euro exchange makes it look a bit pricey at present. But it is a cracking bottler though. Aleman wrote: The big Ferrari floor stander bottle capper that Rob sells is unbeatable . . . And most certainly unbreakable! 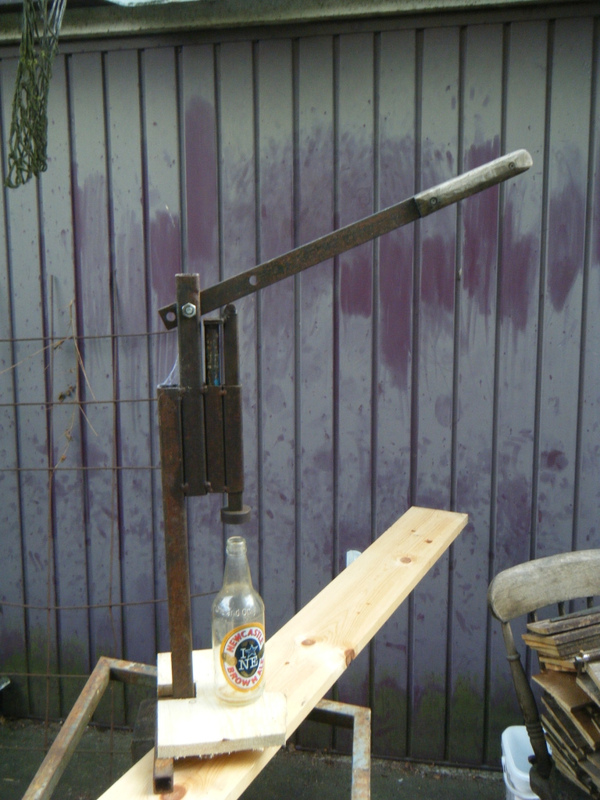 Just been using the bench capper from The Maltmiller. Thanks to the recommendations on this post. Very easy to use for range of bottle heights. My only question. Why didn't I get a bench capper five years ago when I started this brewing thing? I have the Grifo Super, which is sold as the "Deluxe Bench Capper" at More Beer and Williams Brewing, among others. I am still happy with the purchase more than a year and many, many batches later despite the dear price. The capper is SS and hardened steel, and will outlast me. I recommend it highly.